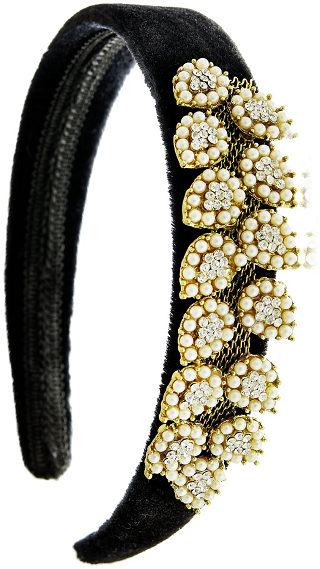 Dress Up Your Hair With These Stunning Hair Accessories! Is there and end to how much we girls love jewellery? And shopping for wedding jewellery is non-stop ohhhs and ahhhs. If I could, I would wear all of it every single day! We love all those jewels as much as you do, which is why we’ve hand-picked a few of the most gorgeous ones. 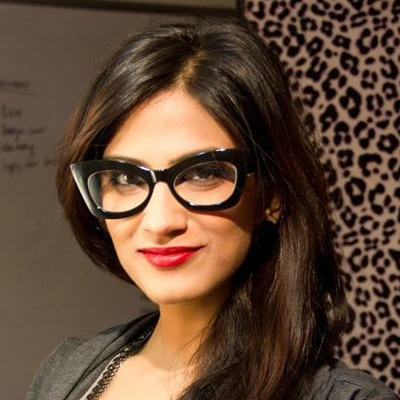 Your sangeet ki raat is actually THE function where you can really experiment with your look. So don’t just stick to the basic and take a look at these 8 extremely gorge sangeet hair accessories. 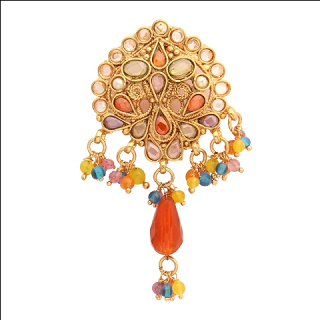 The must-have accessory that goes with almost all Indian outfits is the good ol’ maangtikka. However, this one’s a bit different! We love the colours, the mirror work and those pretty little pearls. AND the fact that’s it’s not just a thin chain but way more intricate. If your sangeet outfit is colourful or bright, this is just what you need to complete the look! Price: Rs 3,700. Buy it here. The borla has made a huge comeback! And we’ve seen so many on the wedding scene. 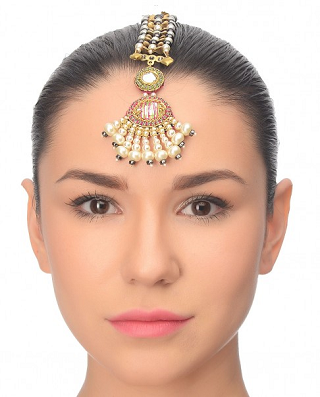 Style your sangeet lehenga with this pretty jeweled borla. 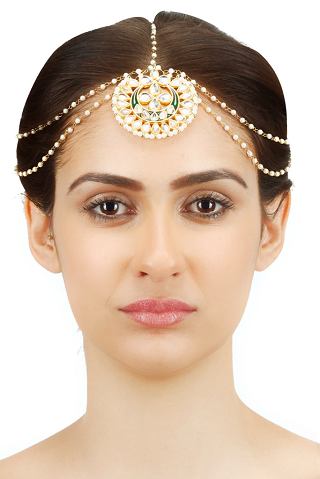 For the bride who wants simple head jewellery, this is just perfect :) Match it with earrings which have hints of red and you’re all set! Price: Rs 240. Buy it here. We’ve all worn hairbands as children and it’s time to do so again! Only now, they come with pretty embellishments. It’s an easy accessory that’s sure to make your hair look fabulous. Wear it with a crop top and lehenga set, or even an gown. Price: Rs 1,500. Buy it here. Wearing a gown for your cocktail? Then you’ve got to accessorise right - classic and elegant. This swarovski hairpin is just the right amount of glitter. Oh, and smokey eyes or the double-winged eyeliner will totally work here! Price: Rs 3,025. Buy it here. Are you crushing just as hard as we are? This is prettiness at it’s best. As a bride-to-be, you’ve got to go that extra distance with your jewellery and this maathapatti will do just. Pair it with your anarkali and dance away with your besties. Price: Rs 4,400. Buy it here. 6. The passa we love! It’s the newest wedding accessory we’ve been seeing all over! Passas look gorge on every face type. We love how delicate this piece looks, especially with those pearl drops. Pair it with a sharara and get ready to dance, baby! Price: Rs 4,500. Buy it here. 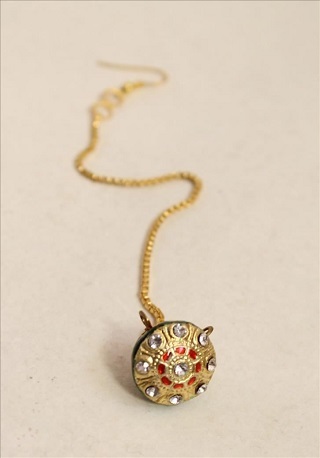 Juda pins may have disappeared from our vanity box. On special occasions, these can make your bun look absolutely fab. Dress up your juda with this fun colourful piece. Price: Rs 450. Buy it here. 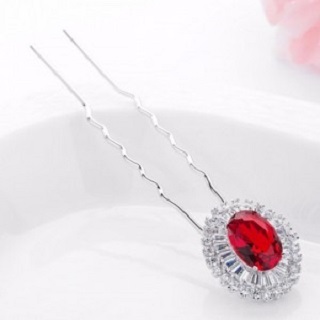 The easiest way to go glam up is to slip on a striking ruby pin. When your earrings and neckpiece are heavy, it’s best to keep your hair accessories minimal. 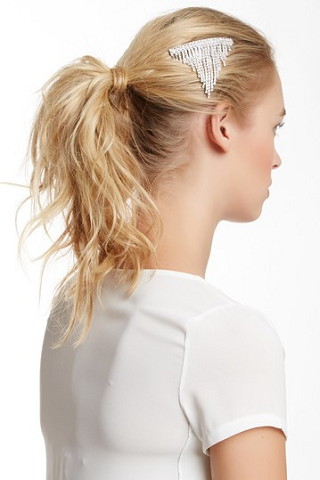 Just sweep your hair to the side and slip on this hairpin or slide it in your messy bun. Price: Rs 699. Buy it here.